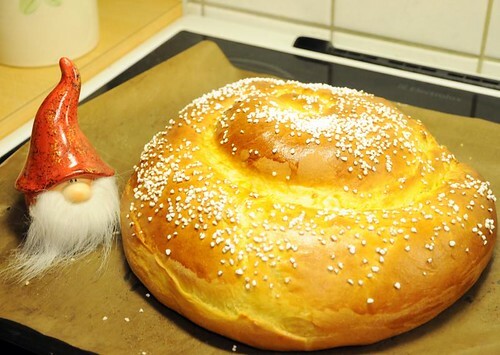 Tomorrow is St Lucia's Day which is always very celebrated in Sweden. (You can read about it here.) A must for me is the saffron Lucia buns, but since saffron makes the dough very dry, I prefer my buns to have a moist and sticky filling. I found this idea at one of my favorite Swedish food blogs, Linnéas Skafferi - butter and white chocolate. I use less saffron than she did, mostly because I just didn't read the recipe very well and missed it, but it was still very good. I was aiming to make normal, small buns, but ran out of paper liners after half the batch, and so decided to make one huge, giant bun. Or a snail - a large Saffron Snail. Not sure if you can see it in the photo, but the thing is so big! It nearly covered the entire baking sheet. And fed most of the office. Everyone was surpremely grateful, and it tasted delicious. The rest of the buns are safely stashed in the freezer, I'll give them a few seconds in the microwave before serving, as they're at their very best served slightly warm. For more traditional Lucia Buns, you'll find my earlier recipe here, and another one filled with almond paste, here. Crumble the yeast into a bowl. Pour over the milk, and stir until the yeast is dissolved. Add the saffron. Cover with a towel, and leave to rise until it's doubled in size. It will take about two hours - since you're not heating the milk beforehand. Divide the dough into half, and roll the first half into a large rectangle. Spread with half the butter, and sprinkle with half the white chocolate. Roll, from the long side, into a tight roll. Either cut slices, about 1,5 cm thick, and place in paper bun liners (they look like slightly shorter muffin cups), or shape the entire roll into one huge bun. Repeat, with the other half of the dough. Cover with a towel and leave to rise for one hour. Whisk the eggs with the water and salt, and brush gently onto the buns. Sprinkle with pearl sugar. Bake at 175°C for about 15 minutes - longer if you're opting for the large one, I baked mine for 25 minutes. Looks great! Have you ever tried to substitute Saffron? There really isn't a substitute for saffron! Some don't like the flavor, and then you can just leave it out, but I love it. I love making Lussekatter (did I spell that correctly?)! This is an interesting twist... I might try it for Christmas. I don't want to mess up tonight on the recipe and not have anything for St. Lucia's day. Very helpful and great photo, as always. The buns seems nice and worth a try! I thought that was powder! :D White chocolate is heavenly!